Lynda Obst is one of the most prolific female producers in the film industry. Her hit films including Flashdance, The Fisher King, Sleepless In Seattle, One Fine Day, Contact, Hope Floats, and How to Lose A Guy In Ten Days, have received critical acclaim, and combined have amassed two Oscar wins, an additional eleven Oscar nominations, four Golden Globe wins and an additional eleven Golden Globe nominations. Her mini-series The 60's also received three Emmy nominations. She is an Executive Producer on TVLAND's Hot in Cleveland, which garnered two SAG Award nominations and one win for star Betty White. She is currently actively developing and producing both features and television and has a deal at Sony Pictures Television. Obst is also a well-known commentator and best selling author, frequently writing and speaking about both the industry and issues surrounding women in entertainment. Her non-fiction book: Hello He Lied: And Other Truths from the Hollywood Trenches debuted at #1 on the LA Times Best Seller list, where it stayed for 10 weeks and turned into an industry classic, later to be adapted into a documentary for AMC. She has given seminars on the film industry around the world, and has been a moderator and speaker at the annual LA Times Festival of Books. Lynda is currently writing a bi-monthly blog for the Atlantic.com's culture channel, and is a frequent contributor to The Huffington Post. She also writes for the New York Times Book Review, LA Times Book Review, The Nation, and Harper's Magazine. Lynda wrote an Oscar dialogue for both Slate.com and New York Magazine with film critic David Edelstein, and was the moderator for the November 2007 Women in Hollywood issue of Elle. Lynda grew up in suburban New York, received her Bachelor's degree from Pomona College, and studied Philosophy in the graduate program at Columbia University. After Columbia, she began her film and journalism career as the editor/author of The Rolling Stone History of the Sixties. She then became an editor at New York Times Magazine, where she covered such diverse topics as science, philosophy, and publishing. Obst was recruited to Hollywood by Peter Guber, for whom she developed Flashdance, Clue, and Contact. In 1982 she joined The Geffen Company, where she was mentored by David Geffen and worked on Risky Business and After Hours. Thereafter, she left to partner with producer Debra Hill, forming Hill/Obst Productions at Paramount Pictures. They soon made the iconic teen pic Adventures in Babysitting and went on to produce Terry Gilliam's Oscar® nominated The Fisher King, starring Robin Williams and Jeff Bridges. 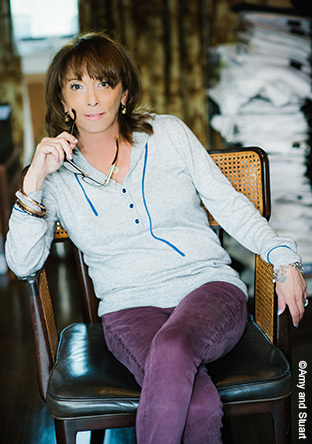 Obst began her solo-producing career in 1989, with a deal at Columbia Pictures where she produced Nora Ephron's directing debut, This Is My Life, and executive produced Ephron's second film, Sleepless in Seattle. Obst then moved to Fox where she produced The Siege, starring Denzel Washington, Bruce Willis and Annette Bening, Hope Floats, starring Sandra Bullock and Harry Connick Jr., One Fine Day, starring Michelle Pfeiffer and George Clooney, and Someone Like You, starring Ashley Judd and Hugh Jackman. One of the projects that Lynda first developed came to fruition in 1997, when she executive produced Contact for Warner Bros., directed by Robert Zemeckis and starring Jodie Foster. Lynda then moved back to Paramount Pictures, where she produced such films as How to Lose a Guy in 10 Days, starring Kate Hudson and Matthew McConaughey, and Abandon, the directing debut of Academy-Award® winner Stephen Gaghan. Lynda didn't limit herself to the big screen. She also executive produced NBC's Emmy Nominated, two-part miniseries The 60s, which broke ratings records and featured a best-selling soundtrack. Her most recent film was the Warner Bros. release of Ricky Gervais/Matthew Robinson's directorial debut The Invention of Lying, starring Gervais and Jennifer Garner. Obst has since added a television division to her company and she is now an Executive Producer on TVLAND's SAG Award-winning Hot in Cleveland. In April 2010, Obst's work as writer, producer and mentor earned her the inaugural We Empower Together Award, celebrating a woman in media who is changing the way the world sees women. In almost two decades in Hollywood, I have learned that our work is most meaningful when we make movies about things that move us, provoke us, inspire us, or engage and compel us. If the products of our efforts reach the screen, the bookstore, the public in any way – regardless of whether they are hits or flops – and if they have some kernel that only we could have provided, it will have all been for something worthwhile. On a more personal level, my most satisfying work has been the impact on -- and collaboration with -- aspiring and up-and-coming filmmakers that I have had the good fortune to have helped, sometimes without my even knowing it. I rediscover the pleasure in my work each time someone I meet tells me that my books, articles, or lectures, reached them in some way; that I may have helped another bright light shine. This is the impulse behind this Web site. I hope this site empowers you in even the smallest of ways. Thanks for visiting. I welcome your feedback.